It has been a good week for mobile fans in Japan, having not only been told they’ll be getting the Sony Xperia Tablet Z very soon, but also today local network NTT Docomo revealed its spring 2013 line-up of a dozen new devices. At the top of the list is the LG Optimus G Pro, which was leaked recently, and is equipped with 2013’s most desirable feature – a 5-inch, 1080p screen. LG was one of the first companies to announce it was working on a 5-inch screen with a Full HD resolution, but as this is the first device we’ve seen from the manufacturer to use one of the panels, it means the likes of HTC and Sony managed to beat the company into stores. 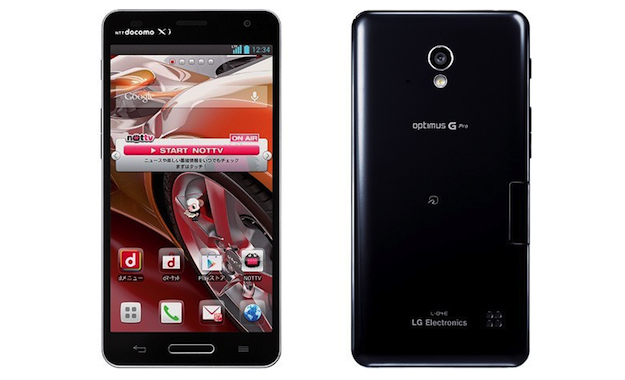 The Optimus G has proven to be a popular flagship Android phone, so it’s unsurprising to see LG continue to trade on its good name; plus the remainder of the Optimus G Pro’s spec list reads like a checklist of must-have features for top-end smartphones this year. You already know about the 5-inch, 1080p panel – which has a pixel density of 440ppi, considerably more than the already excellent 312ppi found on the 4.7-inch Optimus G. Then we have a 1.7GHz quad-core Snapdragon S4 Pro with 2GB of RAM to help it keep the Android 4.1 Jelly Bean operating system running smoothly. A 13-megapixel camera sits top-center on the shiny rear panel, there’s 32GB of internal storage memory and a microSD card slot to increase this by up to 64GB. Additionally, the phone has NFC, LTE connectivity and a forward facing video-call camera. It’s a heavy old beast though, as it weighs in at 160 grams, plus it’s 10.1mm thick too. While the 3000mAh battery certainly contributes to this increased size and weight – the Optimus G is 145 grams and 8.5mm thick – it doesn’t compare favorably alongside the Sony Xperia Z, which weighs 146 grams and measures just 7.9mm thick, however its battery is rated at 2330mAh. Some may consider this a trade-off they’re willing to make. The LG Optimus G Pro will go on sale in Japan this April, however prices haven’t been discussed. As for an international release, the Optimus G spent sometime as an exclusive in Korea before making its way out into the world, so there’s a good chance the Optimus G Pro will follow in its footsteps. With Mobile World Congress just a few weeks away, and LG already saying it has some big-screen surprises waiting for us, we’d expect to hear something more about LG’s international plans for the G Pro at that time.